Okay boys and girls. A bluebook exam question for you. What is the big excitement all about in the New York 23rd CD race that has captured the attention of the political world for the past week? I'll give you a really strong hint in the form of this observation from yesterday's Washington Post: "It is now a two-person race between Hoffman and Democrat Bill Owens with Scozzafava fading badly." While in the North Country to announce electricity discounts for small businesses and dairy farmers, Gov. David Paterson was asked about the NY-23 race and gave an impromptu endorsement of Democratic nominee Bill Owens. ...Owens' campaign didn't exactly alert the media about this. There was no press release trumpeting the news about Paterson's support. 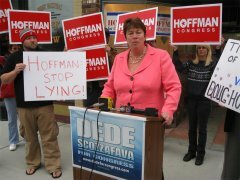 Assemblywoman Dede Scozzafava's campaign was overjoyed to learn the poll-challenged governor had given Owens' his official support, immediately uploading the moment to YouTube and disseminating the link to members of the media outside the district who have been following the race. Apparently, Paterson's historically low poll numbers and the risk he'll be a drag on Owens isn't the only problem here. According to Watertown Times reporter Jude Seymour, who has been doggedly covering every twist and turn in this race, the governor got some of his facts wrong by saying Owens had "actually helped to bring troops" to the area, which is simply flat-out not true. As Jimmy Vielkind notes, this isn't the first time Paterson has assisted Owens, although it is the first time he has been quite so public about it. I'm unsure what the thinking is behind having the governor in the district so close to Election Day, particularly when the Club for Growth featured him - along with House Speaker Nancy Pelosi - in a TV ad earlier in the campaign. Psst! Beth. The Club For Growth has released a recent poll showing a certain Conservative candidate surging to the lead in this race. Do you have any idea who that might be? After the GOP lost the NY-20 special election, several observers told me they thought Assemblyman Jim Tedisco had missed an opportunity by failing to try to link his Democratic opponent, now-Rep. Scott Murphy, to the faltering Paterson. The governor didn't campaign for Murphy, but raised money for him behind the scenes and attended his election night victory party. Clearly, Scozzafava's consultants don't intend to make the same mistake. Beth, I do believe it's time for you to break out of your insular cocoon. Spread your shimmering wings in the warm sunlight of the brave new political world and fly, butterfly, FLY!